Lowest recorded price: $11.99 today! This is the all-time lowest price we have seen for this product - $2.00 less than the previous price. That's a 14% discount, could be a good deal! Click here to see prices from other sellers. 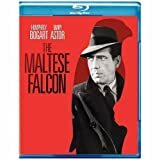 The Maltese Falcon (Blu-ray) from Warner Bros.